This Nova Scotian distillery (not long a go a Maritime secret) is rapidly building a following across the country. Located in Lunenburg’s old blacksmith’s shop on the historic town’s waterfront, co-owners Pierre Guevremont and Lynne MacKay make a variety of spirits and liqueurs. A stone’s throw from the docks that moor the Bluenose II schooner, Lynne and Pierre have cleverly retrofitted the shop to accommodate the distillery, while preserving the historic nature of the building. Now, spirits rest in barrels where the blacksmith once kept his pigs. Hot water from the stills is piped through the fermenting cellar floors to keep the temperature up through the winter. Pierre and Lynne spend a good deal of time in Normandy, learning and drawing inspiration from masters in the region. 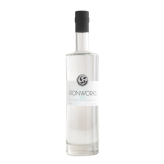 At home in Nova Scotia, they apply the same care and attention to cultivating a network of farmers and suppliers: At Ironworks, white spirits such as vodka and gin are distilled exclusively from local Annapolis Valley Honey Crisp apples. 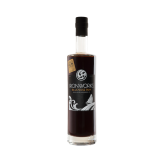 The rums are produced with locally-made Crosby’s molasses. Distillations happen in very small batches in a custom-made wood-fired copper still. Spirits are then aged in either new Hungarian oak, or old Jim Beam bourbon barrels. Their pear eau-de-vie is made in bottles hung from the trees of Boates Farm in nearby Woodville. Gold medal-winners at the World Brandy and World Rum Awards, Lunenburg’s secret won’t stay hidden for long.